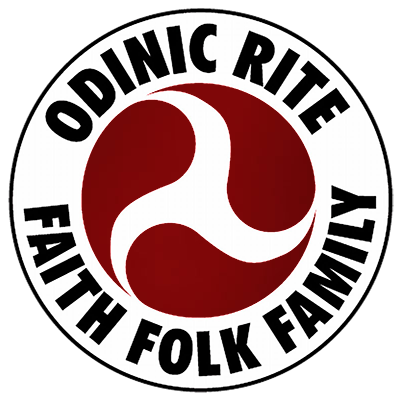 I do not know the true figures, but I would hazard a guess that about 80% of the Odinic Rite membership celebrates its religion in a solitary manner. Which means that for the vast majority of us Blot and Sumbel are simply not going to happen – we have no-one with whom to share such occasions, no-one we can join in prayer or practice. Or have we? Actually, we solitaries do have others that we can share these rites with. We have the Gods and Goddesses of our faith and it is, after all, to these deities that our high days are addressed. It is to them, not one another, that we raise our banners and mead horns, our voices and chants. The lack of fellow Odinists with whom to celebrate does not mean that we have to have a lack of meaningful ceremony. The rituals in the Book of Blotar are very easily adapted to solitary use and by observing these special days – even if we do so alone – we will achieve several worthwhile things. Firstly, we will grow spiritually. By honouring our Gods we move ourselves closer to them. After all, how can Odin hear you if you never speak to him? How can Frigga know you if you never talk to her? By holding Blot, Sumbel and/or daily devotionals and prayers we draw the High Ones into our hearts and minds. This in turn strengthens our faith and nourishes our spirit. Secondly, the Rite itself will benefit from our ritual workings. By following the monthly Blotar, even as a solitary, we can become well versed in Odinic practice. So much so, that if and when we eventually do share Blot with brother and sister members, the goings on, the words used and the structure of the ceremony will be almost second nature. Meaning that the Gothi does not have to worry about the folk fluffing their lines or misunderstanding their role. Ritual is a Holy experience, but it is also a form of theatre and as participants we should know our lines and should never need a prompt. Thirdly, and in my view most importantly, by holding daily devotions and regular Rites we make the Gods themselves stronger. The ancient Celts believed that if one ignored a spirit it would lose its power and eventually die but if you honoured it, recognised it and kept it in mind it would grow stronger and more powerful. I believe that the same is true of our Gods. The rise of the Eastern faiths has pushed our deities away from their folk. But by calling out to Thor and Sif we can begin to regain the strong bond that once existed between the Gods and their people. By making an offering to Freyr we can help to empower him, bringing him back into our psyche, restoring him, his sister and all of our Holy Gods and Goddesses to their rightful place – our hearts. Just as spiritual practice can nourish you, so to can it nourish our Gods. When one considers the very real benefits of solitary worship it is astonishing to me that so many Odinists, indeed, so many Pagans of all denominations, see Ritual as a purely group thing that can never be attempted alone. Well, you can do it alone and, if you are serious about your faith then you SHOULD do it alone whenever a group is unavailable to you. Modern Enemy – Modern Psyche The Yule Tower, Heart(h) of the Northern World.